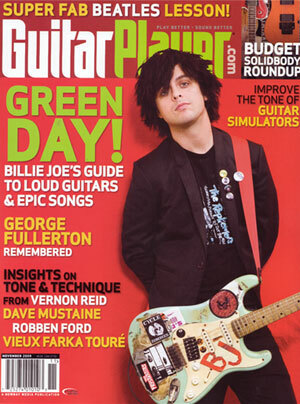 The November issue of Guitar Player Magazine has a feature on Billie Joe Armstrong, and it was cool to see that his stage rig has been upgraded to include a BBE Supa-Charger! 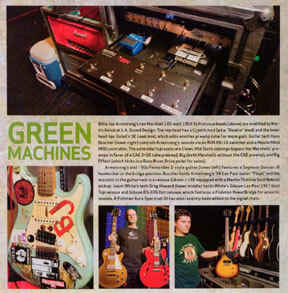 At BBE, we know getting great sound on tour is always a challenge. No matter how good the instruments and other gear is, clean, convenient power is important to getting the best tone. 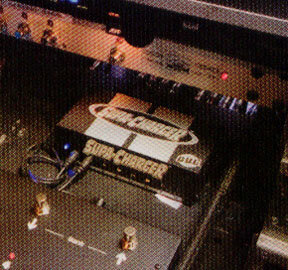 The Supa-Charger is a high-performance universal pedal power supply that features a custom-wound, "zero hum" toroidal transformer; eight outputs that are isolated, regulated and filtered, and a selectable input mains switch to accommodate 110-220 voltages, enabling the Supa-Charger to be used worldwide. Why are more top artists are taking the Supa-Charger on tour? 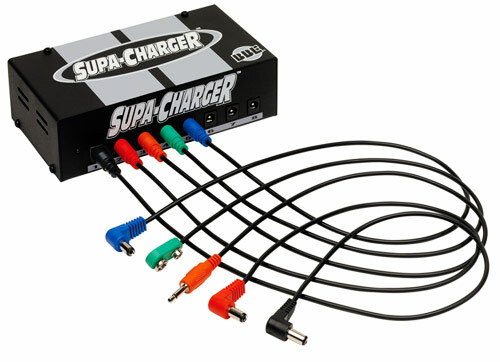 The unmatched convenience, flexibility and reliability of the Supa-Charger make it the ideal power solution. Night after night, city after city, country after country... when it's time to get serious, depend on BBE.